Dr. Osmar Arandia majored in Business Administration at the Monterrey Campus of ITESM. He graduated in 1993. Subsequently, he earned a Master’s degree in Marketing from the EGADE Business School in 2011. He holds a doctoral degree in Management Sciences from the Business School, which he was awarded in 2012. His specialty is Strategy and Social Responsibility and the title o his thesis is “Humanistic Management: A case study from the Steel industry”. His research interests focus on social responsibility, business ethics, and humanistic management. 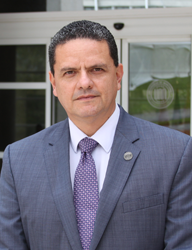 As regards his professional trajectory, Osmar has held the positions of Academic Director of Administration at UDEM. He has also been the Director of Strategic Development at the UCC, and the Coordinator for Business graduate degree programs at that institution. In industry, he has held senior posts in the commercial and marketing areas of several companies, in both the industry and services sectors.